Attorneys Michael Keating and Joseph Vietri of Keating Law Offices have successfully settled a lawsuit on behalf of a Chicago bicyclist who suffered severe injuries after he was hit while riding in Lincoln Avenue's designated bike lane. The incident occurred on the morning of August 26, 2010 near Lincoln Avenue's intersection with Damen Avenue and Irving Park Road. The bicyclist was heading south-eastbound within the bike lane. At the same time the driver of a vehicle, also traveling south-eastbound, attempted to pass the bicyclist on the left. The driver failed to complete the pass and instead slammed his car into the bicyclist. The victim bicyclist was thrown from his bike onto the pavement with such force that the impact cracked his helmet. He was rushed to a nearby hospital where he was diagnosed with multiple serious injuries including a left hip fracture, sprained left wrist and shoulder, and severe road rash. 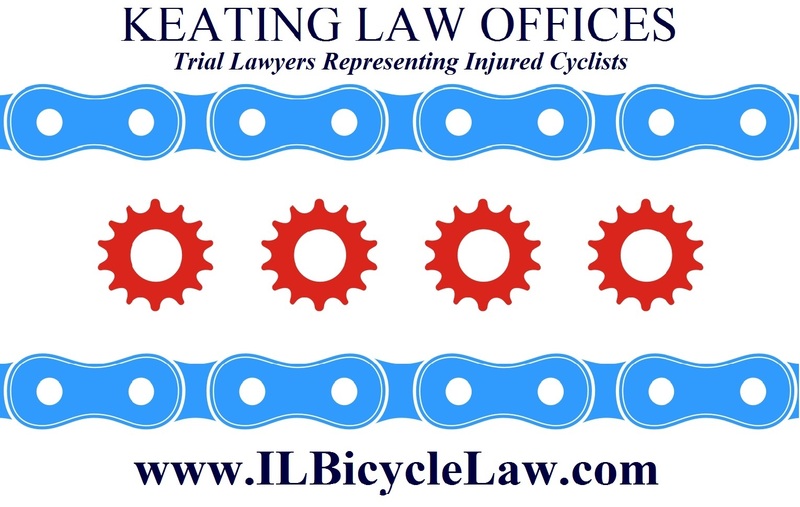 After filing a lawsuit in the Circuit Court of Cook County on behalf of the injured bicyclists, the attorneys of Keating Law Offices were able to reach a successful settlement with the defendant driver's insurance company. The settlement covered the cost of the bicyclist's physical injuries, medical treatment and the damage to his bike. The attorneys were able to obtain this settlement by arguing that the driver had clearly violated numerous provisions of the Illinois Motor Vehicle Code and the Municipal Code of Chicago. "operator of [a] motor vehicle overtaking [a] bicycle traveling on the right side of the roadway shall not turn to the right in front of the bicycle... until such vehicle has overtaken and is safely clear of the bicycle." "leave a safe distance, but not less than 3 feet, when passing a bicycle..."
In this case, the driver obviously disobeyed his legal obligations to use care and to leave a minimum safe distance of 3 feet when attempting to pass a bicyclist - a decision which resulted in painful and long-lasting consequences for the victim. 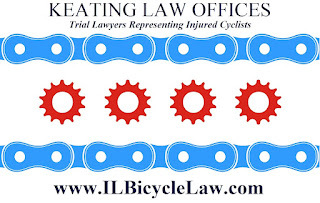 The Illinois Bicycle Lawyers of Keating Law Offices have experience representing bicyclists who have been injured while riding in Chicago's bike lanes. While Chicago is one of the world's leading bicycle-friendly cities, its network of bike lanes and signs warning drivers about the presence of bicyclists does not guarantee the safety of bicyclists under all circumstances. Bicyclists continue to be the victims of impatient, inattentive and reckless drivers even on routes as popular as the Lincoln Avenue bike lane. Our firm has previously obtained settlements, like this case's, on behalf of bicyclist injured while riding in Chicago's bike lanes including the Kinzie Street protected bike lane and the West Roosevelt Road designated bike lane. If you have any questions about this post, or any question about Illinois personal injury law, please contact Illinois Bicycle Lawyer Mike Keating by calling him at 312-208-7702 or emailing him at MKeating@KeatingLegal.com, 24 hours a day, 7 days a week. All emails and phone calls are returned promptly. All initial consultations are free and confidential.